Four lions stand atop the drum, each facing in the four cardinal directions. Their mouths are open roaring or spreading the dharma, the Four Noble Truths, across the land. 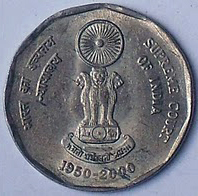 The lion references the Buddha, formerly Shakyamuni, a member of the Shakya (lion) clan. 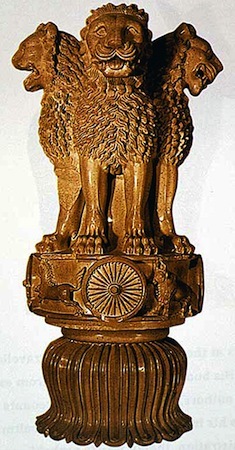 The lion is also a symbol of royalty and leadership and may also represent the Buddhist king Ashoka who ordered these columns. 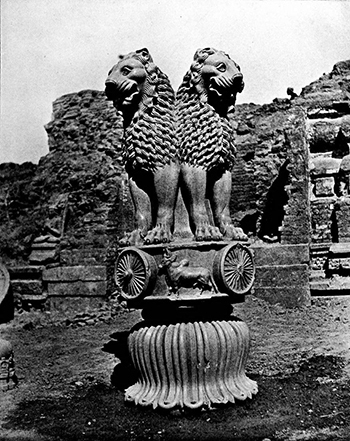 A cakra was originally mounted above the lions. Some of the lion capitals that survive have a row of geese carved below the lions. The goose is an ancient Vedic symbol (Veda means knowledge in Sanskrit and the Vedas refers to the canonical collection of hymns, prayers and liturgical formulas that make up the earliest of the Hindu sacred writings. Many of the Buddhist symbols and practices derive from these early texts). The flight of the goose is thought of as a link between the earthly and heavenly spheres. The pillar reads from bottom to top. The lotus represents the murky water of the mundane world and the four animals remind the practitioner of the unending cycle of samsara as we remain, through our ignorance and fear, stuck in the material world. But the cakras (wheels) between them offer the promise of the Eightfold Path, that guide one to the unmoving center at the hub of the wheel. Note that in these particular cakras, the number of spokes in the wheel (eight for the Eightfold Path), had not yet been standardized. The lions are the Buddha himself from whom the knowledge of release from samsara is possible. And the cakra that once stood at the apex represents moksa, the release from samsara. The symbolism of moving up the column toward Enlightenment parallels the way in which the practitioner meditates on the stupa in order to attain the same goal. Cite this page as: Dr. Karen Shelby, "Lion Capital, Ashokan Pillar at Sarnath," in Smarthistory, August 9, 2015, accessed April 21, 2019, https://smarthistory.org/lion-capital-ashokan-pillar-at-sarnath/.